A new global hub for cancer research and treatment is to be established in London with the aim of accelerating the discovery of new treatments. Transport improvements are also planned for the London Cancer Hub in Sutton, ideally by a proposed £200m tram link. The hub plans to create more than 13,000 jobs and deliver at least two extra cancer drugs every five years. A community of 10,000 scientists, clinical and support staff will be brought together. Professor Paul Workman, Chief Executive of the Institute of Cancer Research (ICR), London, said the ICR and The Royal Marsden were already "world leaders" in cancer research and treatment, but aimed to take its facilities "to a new level". He said: "The ambition is to discover more innovative cancer drugs, to run more clinical trials, and to partner with industry to take even more treatments to patients." 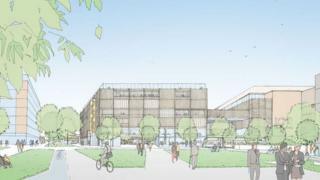 Councillor Ruth Dombey, leader of Sutton Council, said the London Cancer Hub would create "thousands of employment and training opportunities for local people". It is hoped that research and development space will also be created for biotech, pharma and software companies, and equipment manufacturers. The new buildings will closely integrate research and cancer care - providing both laboratories and clinical facilities to promote interactions between scientists and clinicians. Sutton Council also plans to create a new secondary school on the site which will specialise in the sciences. The London Cancer Hub will a partnership between the ICR London, The Royal Marsden NHS Foundation Trust and the London Borough of Sutton. It will be developed on the Sutton site of the ICR and The Royal Marsden and is planned to cover 265,000 square metres - double its current research and treatment space. The Greater London Authority has provided start-up funding. The aim is to finance the initiative through a combination of private investment, Government grants, philanthropy and commercial rental income.